My kids are popsicle professionals. They LOVE frozen treats. It is a constant struggle to keep our freezer filled with freezies and popsicles. I fill up the freezer and the kids empty it. Which is okay, except that it can feel like they are eating a lot of sugar. Yes, the frozen treats keep them hydrated, but the artificial colours and sugar are my only worries. This is why I started adding in homemade popsicles. My girls and I have figured out how to turn seasonal fruit into delicious popsicles. 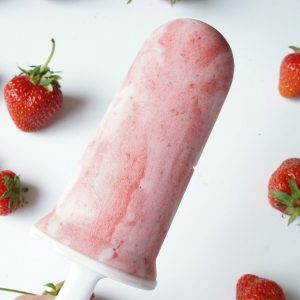 With summer strawberry season being our favourite time of the year, this year I wanted to try making strawberry creamsicles. After all, strawberries and cream are a classic flavour combination for a reason. Let the kids hull the strawberries. Use a small spoon to scoop out the stem of the strawberry. Place strawberries and water in a small pot, over medium heat. Soften strawberries over medium heat. 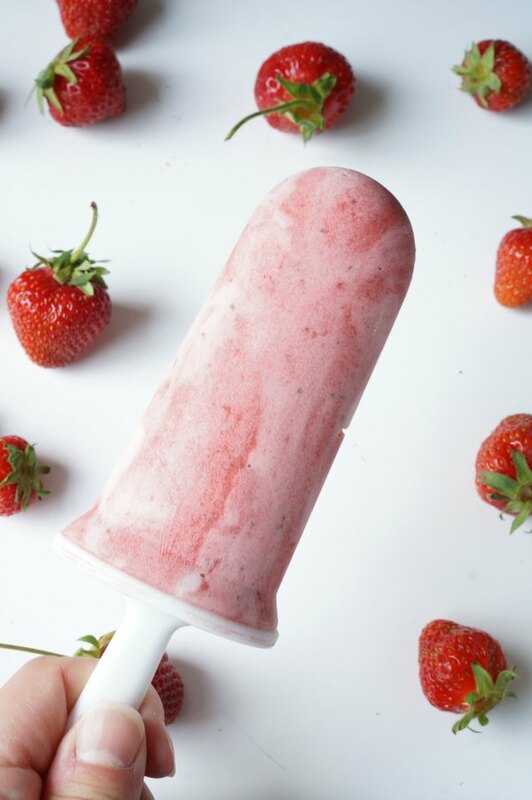 Use a potato masher to crush strawberries. Once strawberries are softened, remove from the heat and pour into a blender. Be careful, the strawberries will be very hot. Puree the strawberries until smooth in the blender. Hold the lid on tightly as the liquid is very hot. Transfer the pureed strawberries to a bowl and place in the fridge to cool. In the meantime, the kids can whip the cream with a hand mixer or inside a stand mixer. Whip for 3 minutes, until the cream begins to thicken and become frothy. When the strawberry liquid is completely cooled, have the kids fold the strawberries into the whipped cream. Fold the strawberries in as much as you like…leaving streaks of strawberries or making a totally pink mixture. 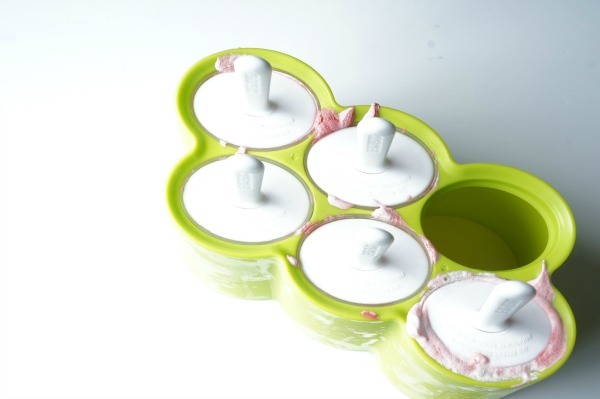 Pour into 4 popsicle molds (depending on the size of your popsicle mold you may make more or fewer). Cool until solid, remove from mold and enjoy. If the strawberries you are using aren’t quite sweet enough, add a tsp of maple syrup or honey to the warmed strawberries. 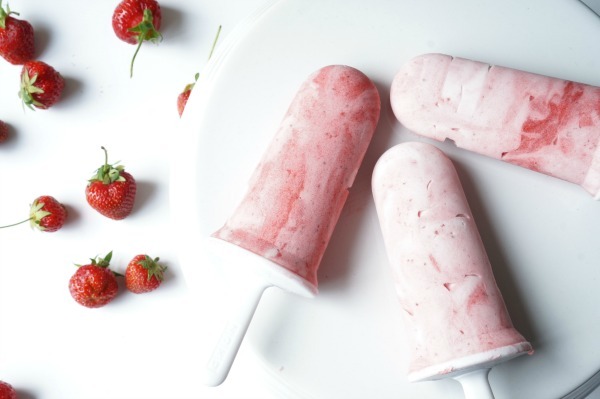 When your freezer is filled with homemade strawberry creamsicles and other ice pops, you won’t mind if the kids eat them all. Making your own means you control the sugar content. Kids love popsicles, but mom's don't love the artificial colours and added sugar. 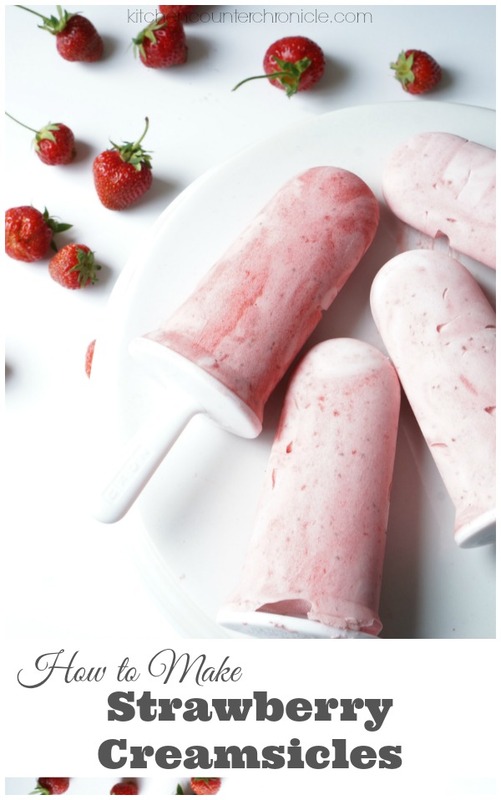 Find out how to make artificial colour free strawberry creamsicle - a delicious summer treat. Place strawberries and water in a small pot, over medium heat. In the meantime, whip the cream with a hand mixer or inside a stand mixer. Whip for 3 minutes, until the cream begins to thicken and become frothy. When the strawberry liquid is completely cooled, fold the strawberries into the whipped cream. Fold the strawberries in as much as you like...leaving streaks of strawberries or making a totally pink mixture. 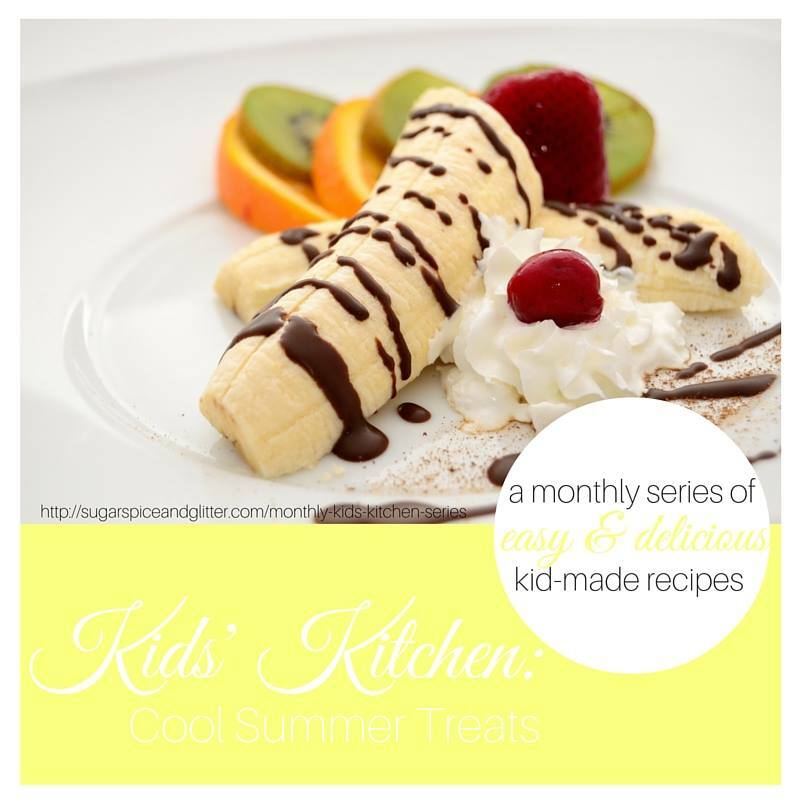 Today’s post is part of the Kids in the Kitchen Cool Summer Treats blog hop. Head over to the other participating blogs to discover all the deliciously cool treats being shared.